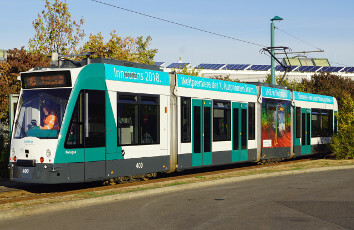 Siemens mobility demonstrated a tram it has modified in collaboration with, ViP Verkehrsbetrieb Potsdam GmbH, the municipal transport company in Potsdam in eastern Germany. The vehicle is being testing without passengers on a six-kilometre track section that crosses several relatively quiet roads, both with and without traffic light control. A driver in the cab can intervene in the process at any time and perform emergency braking. ViP said this was the prerequisite to carry out test drives in real traffic. It said it assumes that the next generation of vehicle will need a driver for the next few years. ViP technical manager Oliver Glaser said: ‘Assistance systems will play an important role in the upcoming procurement of new trams. In the autonomous tram, components of such systems are used to avoid accidents making the tram even safer. ViP said the project is currently a research and development project that does not yet have commercial application, with the complete research, development and conversion costs borne by Siemens. It added that the start of the project, whose starting point was the further development of existing driver assistance systems, was carried out under high secrecy in September 2017.